The Victorians seem, Gentle Reader, rather obsessed with hair. Not in the “I must eliminate every scrap of it from my body” modern way. (Or Ancient Egyptian come to think on it. Did you know they coated themselves with olive oil and shaved the entire body with a flat razor? I’m waiting for some high-end salon to reinvent this method, but I digress.) No, the Victorians went in for an almost perverse “I must collect and keep all hair” approach. Perhaps this had something to do with coming out of the Regency period, one of the first times in history when a few of the more daring Western women actually cut their hair short for fashion (rather than to wear a wig). Regardless of the reason why, Victorians became enamored of long hair on women; it could increase a dowry, was a marker of female virtue, and sign of femininity. They collected hair in special little jars called hair receivers. These jars are what archaeologists would call a diagnostic artifact. They exist almost exclusively in England, some parts of Europe, and America, and only for a narrow window of time. 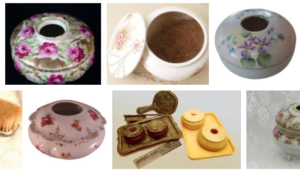 As a maid bushed out her lady’s hair, she collected the long strands in one of these containers. Once full, the hair was sent away to a hair designer who formed it into a fall, extra stuffing for a bun, or some other useful attachment for an elaborate updo. But it was Victorian hair jewelry or mourning jewelry that really marked this era as obsessed. Some people are revolted by the very idea of hair work, but I think the results are quite remarkable. 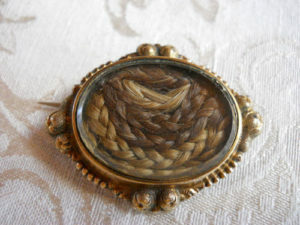 Generally, hair jewelry was made from the hair of a deceased loved one. Often the metal catch or backing would be engraved with the person’s name and “In Memorium.” But not always. 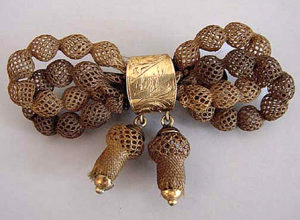 Like giving a lover a lock of hair, sometimes hair jewelry was made as a gift. Queen Victoria reportedly presented Empress Eugene with a bracelet of her own hair. Americans also embraced the concept, particularly during the Civil War, when soldiers (who often had long hair) would leave a lock with loved ones to be made into jewelry when they died. As with all things, hair jewelry eventually became quite Fashionable, possibly tied to Queen Victoria’s impossibly morbid streak (the one that characterized her personality after Albert’s death). It died out (pardon the pun) just after she did. At its height of popularity, Godey’s offered to make jewelry for interested young ladies.